Sceptical medicos Justin Coleman and Liz Sturgiss take on a world of pain. Are opioids taking over the world? We look at various cognitive biases when doctors make decisions. Liz tries to persuade Justin that we all want to be normal. Then she spoils her argument by pulling out a toy plane. Innovative pain therapy with a fixed combination of prolonged-release oxycodone/naloxone: a large observational study under conditions of daily practice. Current Medical Research and Opinion, 2010. Dr Neko Richiko liked the cognitive biases so much, she wrote it down. In VERY neat handwriting! This entry was posted in podcast and tagged #FOAM4GP, #FOAMed, cognitive bias, GP, pain, sceptic. Bookmark the permalink. Thanks Genevieve – that’s a great link. Maybe Dunning and Kruger are examples of the Dunning-Kruger effect. What their study showed is that self-evaluation of competence isn’t completely a function of actual competence. The subjects who did poorly overestimated their ability while those who did well underestimated it. Those around the middle tended to be better at predicting their scores. What any competent statistics student could have told them is that when you look at results towards the tails of the bell curve then check those subjects against a different, at least partially independent measurement you will generally see results closer to the middle of the curve. It’s called ‘regression towards the mean’. 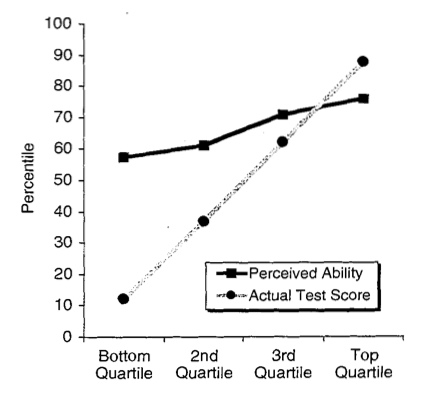 The Dunning-Kruger effect is probably nothing more than a statistical artifact – a hypothesis supported in follow-up studies by Krueger (with an ‘e’) & Mueller in 2002 and Burson, Larrick & Klayman in 2006. But it has become a part of academic and popular folklore because it appeals to the prejudices of those of us who think the world can be divided into the smart and the stupid and that we fall squarely into the former category. That’s really interesting, thanks Cabrogal. I didn’t know any of that. I had never actually read about their original study, but the ‘regression to the mean’ theory certainly makes sense. Thanks for alerting me to it. I’ll hopefully include that in an upcoming podcast. the ‘regression to the mean’ theory certainly makes sense. Setting aside the non-sequitur (i.e. Why would your inability to estimate my competence cause you to underestimate your own?) the phraseology they use makes one sound like the corollary of the other when in fact they are unrelated. William of Ockham would have slashed their tyres.